BAGHDAD - Three suicide car bombers struck Shiite pilgrims south of Baghdad on Thursday, killing at least 51 people and wounding more than 180 in a third straight day of attacks across Iraq. The string of assaults, reminiscent of the bloodiest days of the Iraq war, shattered a two-month lull and presented a major challenge to the new government of Prime Minister Nouri al-Maliki, who must soon decide whether to ask U.S. forces to stay after the end of the year. Thursday's attacks were particularly significant because most of the victims were Shiite civilians, the government's core constituency. A lawmaker allied with anti-American cleric Muqtada al-Sadr, whose support for al-Maliki was crucial in enabling him to remain prime minister, accused government security forces of "not acting in a professional manner" to protect the pilgrims. "I expect the attacks will continue ... due to the negligence of the security forces," the lawmaker, Hakim al-Zamili, told The Associated Press. The attacks took place at mid-afternoon Thursday at three security checkpoints  one north and the two others south of Karbala, where millions of Shiite pilgrims are converging for rituals marking the 7th century death of Imam Hussein. He was a grandson of the Prophet Muhammad, who was slain near the city by Muslim rivals. Ali Khamas, a pilgrim from the Shiite neighborhood of Sadr City in Baghdad, said he saw a car speeding toward one of the checkpoints, its driver refusing to stop despite warnings shouted by Iraqi soldiers. "He sped up and blew up his car near the checkpoint," said Khamas, a 42-year-old truck driver. "After the explosion, people started to run in all directions, while wounded people on the ground were screaming for help. I saw several dead bodies on the ground." The dead included a dozen Iraqi soldiers and policemen as well as an undisclosed number of women and children, officials said. No group claimed responsibility, but suicide attacks are the trademark of the Islamic State of Iraq, an al Qaeda front group believed made up mostly of Sunni religious extremists. Such groups have frequently targeted Shiite civilians, in part because of religious differences and because Shiite parties used their ties to the Americans to gain power after the 2003 U.S.-led invasion toppled Saddam Hussein's Sunni-dominated regime. "The enemies always develop their tactics and improvise new plans to make use of any security breach," said Karbala provincial councilman Shadhan al-Aboudi. He blamed the blasts on al Qaeda and Saddam loyalists. "They have apparently found a gap today in the security measures and they carried out an evil act against innocent believers who were practicing religious rituals," he said. Since the end of Saddam's rule, Shiite politicians have encouraged huge turnouts at religious rituals, which were banned under the former regime as a demonstration of Shiite power. Last month an alliance of Shiite parties took control of the government following elections in March, during which the Sunni-backed Iraqiya party won bragging rights by finishing first with a two-seat plurality. With Iraqiya given a role in the new government, hopes were high that the Iraqis might be able to set aside sectarian ethnic and religious differences and begin the arduous task of rebuilding the country after nearly eight years of war. Those hopes began to fade Tuesday when a suicide bomber struck a group of young men seeking to join the police in the northern city of Tikrit, killing 65 people. The next day, a suicide bomber blasted a police compound in the eastern city of Baqouba, killing another three. 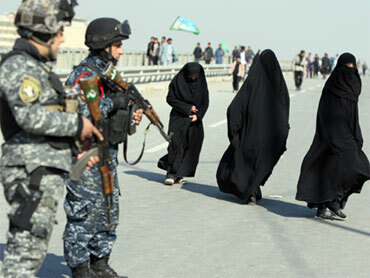 Al-Maliki adviser Adil Barwari said the attacks show extremists' determination "to undermine the new Iraqi government." He also said the insurgents were trying to frighten neighboring countries from sending delegates to the Arab League summit in Baghdad in March  the first time Iraq has hosted the meeting in 20 years. "They want it to fail," Barwari said. "But al Qaeda will not succeed in achieving this goal." Although the government was formed a month ago, al-Maliki has yet to appoint ministers of defense, interior or national security, leaving him in charge of Iraq's entire security force. The attacks have increased pressure on al-Maliki, whose power base is in Karbala, to fill those positions  a task which will require hard-bargaining with the parties in his government because of the power those ministries wield. "We have said more than once that the security situation is fragile and security violations will increase," said Amir al-Kinani, a Sadrist lawmaker. "The prime minister and other political blocs are responsible for these security violations. They have to take care of the situation." If large-scale attacks continue, they will likely sharpen the political debate over whether to ask President Barack Obama to extend the presence of U.S. forces beyond the Dec. 31 deadline for their withdrawal set down in an agreement reached with the Iraqis in the final months of the Bush administration. Al-Maliki has insisted that Iraqi forces are capable of maintaining security on their own, although it is widely assumed that his government will ask for at least some residual American presence despite opposition by the Sadrists and others in his government. U.S. officials have said they would be willing to consider an Iraqi request to extend the American stay, but they want a decision by early spring in order to make plans for moving out the remaining 47,000 troops and equipment. No such request has been made, and U.S. officials have said they would need to know by the summer if the Iraqis want a continued American presence.